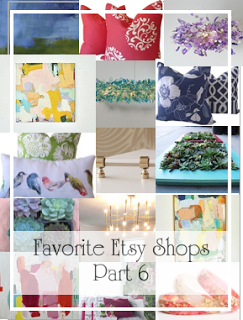 It’s Tuesday so it’s my 12 favorite Etsy shops this week. I hope you like them! Aren’t these patterns amazing? I especially like numbers three and four (which I think are the same except for the backgrounds). I think the prices are very reasonable as well. This artist does all types of subjects and mediums. I do really like her florals and landscapes, but as always I’m especially attracted to the abstracts. No explanation necessary, really. It’s lucite, so I love it. There are some fabrics I have literally never seen before, and even a lot of outdoor fabrics, starting at $19. Pretty good I think. I just can’t get enough of these. Mother Nature’s colors are glorious, aren’t they? A reader sent me this link and I’m so glad she did! Those first two photos. I can’t stand the cuteness and my puppy is about that size so I’ve added this to my wish list! And a final example of why I love Etsy. I’ve never seen anything like these. They are marketed as wedding sandals but honestly I can’t see why you couldn’t wear them to the beach as well. Love these shops – thanks Stacy!